The Snazzi is a modern, simple-to-use, special needs pushchair designed to accommodate a wide variety of seating needs. With its quick, all-in-one folding frame, the Snazzi is the ideal travel companion for all of life’s adventures. The Snazzi offers a large range of seat tilt ranging from 10 – 40 degrees. It is controlled by a slow-release gas strut, mounted on the push handles, ensuring both ease of use for the attendant and comfort of the occupant. The tilt in space facility is without fixed positions meaning that the occupant can be positioned at any point within this 30 degree range. Tilt in space offers an assortment of benefits. In particular, it is ideal for those who require postural relief as it is difficult for individuals, even those with high muscle-tone, to remain in the correct seating position for long (and even short) durations. Tilt in space is also a useful tool in providing pressure relief without changing the occupant’s seating position and can aid respiration and digestion by moving the occupant to a specific position. The Snazzi is a high customisable pushchair; everything from its push handles, footrest, seat depth, hip width and back height are easily adjustable to ensure both the perfect fit and maximum growth. The full range of growth can be viewed by clicking here. In addition, the backrest has a fixed recline position of 90 or 95 degrees depending on the needs of the occupant. To further individualise your buggy, a multitude of postural and everyday accessories are available. The full range can be viewed by clicking here. All new Snazzis now come as standard with our new style pin lock brake. This new brake mechanism is not only quieter to operate but also allows for a less strenuous movement to engage the brake. This exciting development manages to combine the stability and security of our previous mechanism with enhanced usability. The fabric covers are easily removable for washing and have been designed out of a breathable spacer fabric which ensures that the occupant remains as comfortable as possible whatever the weather. All our fabrics comply with current British Fire standards. 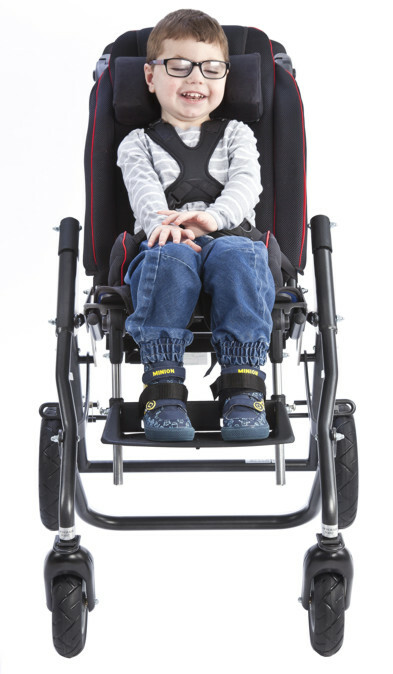 Like our other pushchairs, the Snazzi has been successfully crash tested in accordance with ISO 7176/19 ensuring safe transportation in specially adapted vehicles.